After bawling and walking down the aisle alone, I let out a huge sigh of relief! It was finally time for Bryce and I to get married and this was the easy part! Bryce and I, without hesitation, had chosen to write our own vows for the wedding and I had never been nervous about this. While I am not the best public speaker, I love writing and I love sharing what I write, so naturally, to share my heartfelt vows with Bryce and our guests, was a moment that I was looking forward to. Not only had we chosen to write our own vows, but we also chose to craft our own ceremony as well. 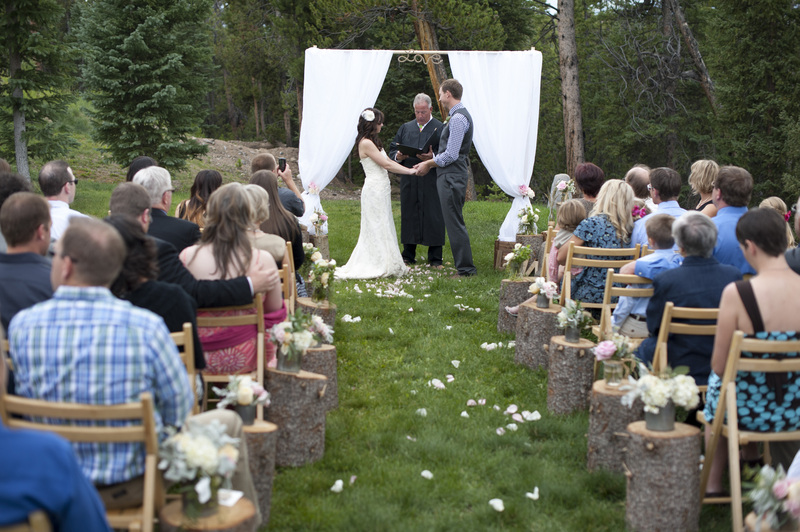 Our wedding planner, through her network of contacts, had helped us find an officiant in Colorado that was willing to travel to our wedding in the woods and mountains of Breckenridge and willing to help us write our ceremony just the way we wanted it. 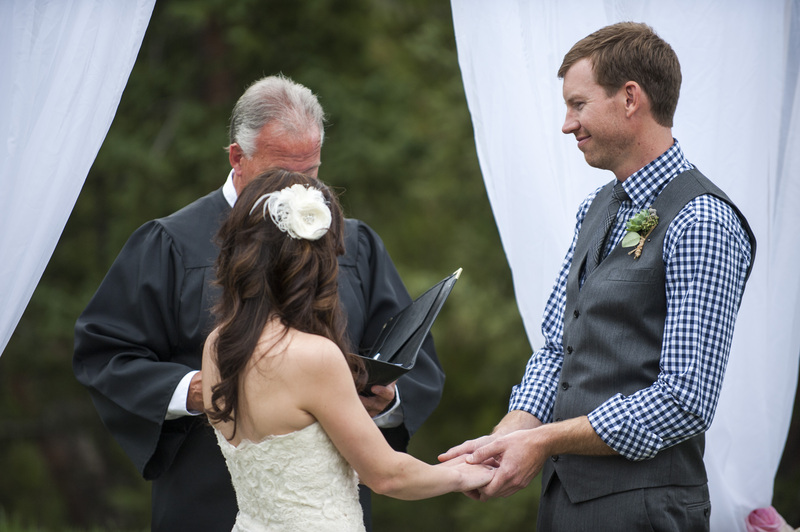 Matt Raynak, our officiant, ended up being a great match for us, as he had a very upbeat and playful personality. I had stressed to our wedding planner that we wanted someone fun and light-hearted to be our officiant because we expected the ceremony to be just the same. 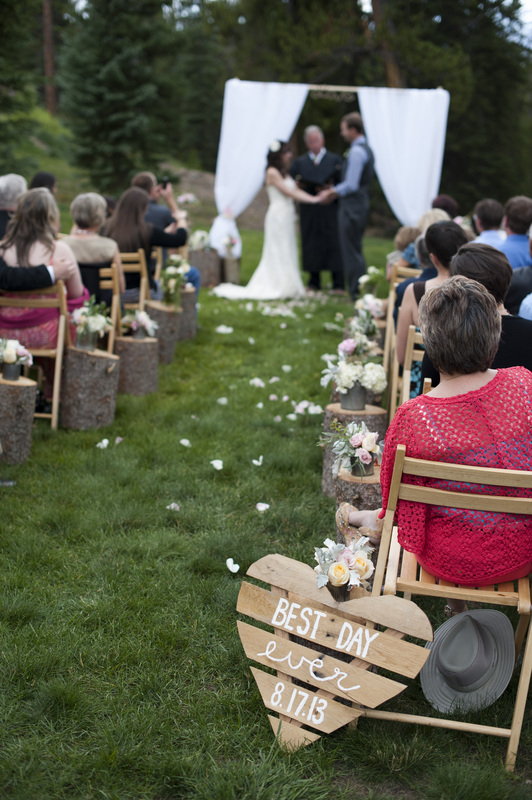 Our officiant ended up being so fun that in the months leading up to our wedding our email exchanges were more playful joking about wearing pom-pom flip flops and crafting a cheesy glitter unity ceremony than about our real wedding. I loved this! But when we weren’t joking about releasing glitter-covered butterflies, we were talking about the serious stuff and figuring out exactly what Matt would say during our ceremony. Since Bryce is not as particular about writing as I am, I was left to do the ceremony wording mostly on my own. Luckily, Matt had given us a few templates of what he could say and we went from there to make it our own. His templates ranged from religious and traditional to casual and spiritual. Bryce and I obviously wanted our ceremony to feel meaningful and not just like a “Justice of the Peace” wedding in a courthouse, but at the same time, we didn’t want to involve religion in our ceremony since that didn’t represent us. I also wanted to be able to tie in our woodland wedding theme to our vows and had just the perfect reading in mind. 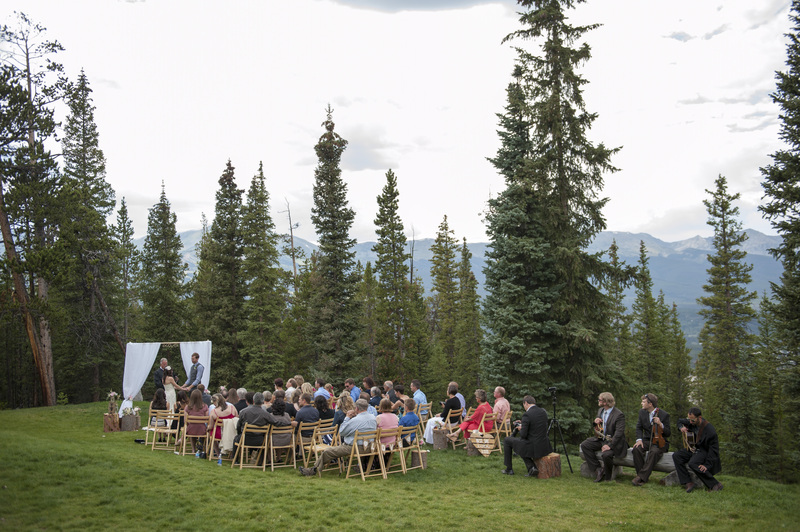 Several months prior, I had heard an analogy that compared marriage to aspen trees and I thought this would be perfect for our woodland wedding. Problem was, I couldn’t remember where I had seen or heard this reading, so finding it was a bit difficult. I never quite found the exact reading I was looking for, but I did find one that was just as good here: Lessons from a Tree. After lots of fine tuning and consulting with Bryce for his opinion, Matt and I had crafted a wedding ceremony that we were all happy with and the only thing left was our vows. I did not procrastinate on writing my vows and got to work on them right away. Bryce and I frequently write each other notes and letters, so coming up with vows was not too challenging for me besides the fact that I clearly needed to write something that topped everything I had ever written Bryce and that would encompass not just that moment (which is what I was accustomed to writing about) but that would summarize our relationship in the past, present, and future. I knew that the biggest reason I did not want to recite traditional vows is because I didn’t like the “I promise this and this and that” structure that traditional vows contain. I didn’t want my vows for Bryce to be a bunch of cheesy, implied promises, although I completely understood that this is the whole intent of vows, by definition. I wanted my vows to tell a story and I wanted my vows to mainly express my love for Bryce and why we were standing there that day devoting our lives to one another. So for several weeks I started jotting down the reasons why I loved Bryce and the things that he would do in my daily life that would make me so happy and lucky to be with him. This wasn’t difficult to do as Bryce was constantly reminding me why I had said “yes” to marrying him on July 28th, 2012. Although I usually pull a lot of my inspiration when writing from others’ blogs and writings, for our vows I had hesitated looking at other couple’s vows because I didn’t want to inadvertently copy something that wasn’t my own. I wanted my vows to be truly all my own words. However, in the initial stages of writing, I did read many other vows to try to get in the mindset of writing for this particular task. Luckily, none of the vows I had read touched me or quite said what I wanted to say to Bryce, especially since I kept finding vows that were structured in the “I promise this and this and that” format. A lot of my inspiration ended up coming from old cards, letters, and notes we had written each other. Even though I had been jotting down inspiration for my vows bit by bit since April when we had met our officiant Matt, I had yet to really put anything together until I received a little nudge from Matt at the end of May asking how our vows were coming. Although our wedding wasn’t until August, I didn’t want to put off this task any longer because I wanted to write down my vows and have several months to read and reread the vows to make sure they were just right. After that nudge from Matt, I wrote down my full vows thinking they would change drastically by the time the wedding came three months later, but they never did. I was more than content with what I had wrote from the beginning and so excited to tell Bryce why I loved him and would always love him. Bryce required much more nudging to get his vows done since he was so busy with work for several months leading up to the wedding. I didn’t want to pressure him into writing when he wasn’t in the mood and “inspired”, but at the same time, I didn’t want him to wait to write his vows and sloppily put something together last minute. He eventually took some of his free time several weeks before the wedding to write his vows and got them done. Because I had had such high expectations for writing my own vows just right, these expectations also leaked out onto my expectations of Bryce’s vows. Mostly, I was just worried that he would write the type of vows that I was specifically trying to avoid – the “I promise this and this and that” type of dull, unoriginal vows. It pained me to leave Bryce to his own devices when writing his vows, but I knew I had to let him write from his heart and not what I was telling him to write. In the end, I don’t know why I ever thought that Bryce would not write something exceptionally good. When we write notes and letters to each other, even in my best efforts and with many revisions, I still don’t write things as ridiculously heart-felt and amazing as him…. and his vows were no exception! “Miranda and Bryce, there is nothing that I, nor anyone else can do or say to make you more married than you already are, for you know you have become one spirit. True marriage is more than two people saying “I do” and exchanging vows and rings. …and of course, I repeated this as well. “Miranda, before our first hike together, I had crazy butterflies. I couldn’t wait to find out the personality of this beautiful and intelligent person. I soon found out you are adventurous, funny, and caring. Adventurous because you trudged through the petroglyph trails until your shoes were filled with sand. Funny because you refused my offer of a dinner date four days later, and then asked if we could grab some food because “two people should not be alone on a Friday night.” And caring because of your love and attention to Banana. Two short months after we began seeing each other I went on a week-long rafting trip, which was a blast but left me lots of time thinking about you. Towards the end of the trip, my sister looked over at me and asked “what’s wrong?” and then “you miss Miranda, don’t you?” I realized how much I loved you. I have known since the very start that we were such a perfect match for each other in so many ways from our love of the outdoors to our relaxed outlook on life. Life with you has been perfect and surreal and I could never fully express how grateful I am for your openness in this relationship, your unconditional love, your constant assurance that I am deserving of you, and your abundant amount of cheesy, cute, romantic confessions that have helped our love grow to what it is now. I love you because we create amazing adventures together and you aren’t afraid to adopt my silly ways. I love you because you often tip over your slice of cheesecake to share my favorite part, the crust. I love you because you make smiley faces with the squeegee when you clean the car windows. I love you because you know all the things my heart desires from Taco Bell 10-packs to bedtime back rubs. I love you because I feel most like myself when I’m with you. And I just don’t know where I’d be without you in my life because you always get things off the top shelf for me. We have been so lucky to enjoy a worry-free and simple life together for the past two years, but I am not naive and I don’t pretend to think things will always be this way. I know that life is a windy road that changes, and with it, people change. And I know that tough times may come our way, challenging the strength and perseverance we have as a team. “A ring is an unbroken circle, a symbol of unity and love, representative of the greater circle of life of which we are all spiritually a part of. Having neither beginning nor end, it is but a continuous cycle of which each of you are an element. Let these rings be a sign that love has substance as well as soul, a present as well as a past, and that, despite its occasional sorrows, love is a circle of happiness, wonder, and delight. … and I repeated this, only, Matt had stuttered on a part of this and almost threw me off when I repeated! Oops! “In human history, we have not yet discovered a better way of life than sharing it together in a love that is lasting and responsible. A shared and secure commitment meets our deepest human needs for love and companionship, for someone with whom we can share in an intimate and trusting way all the hopes, joys, and dreams of life. Love makes burdens lighter because you divide them. It makes joys more intense because you share them. It makes you stronger so you can become involved with life in ways you dare not risk alone. Real love says you are stronger together than when you are apart.It is establishing a relationship, in which the independence is equal, the dependence is mutual, and the obligation is reciprocal. It is not only making your commitment to the right partner, it is being the right partner.